It is 1903 and Cecil Rhodes is the most powerful man in the solar system. 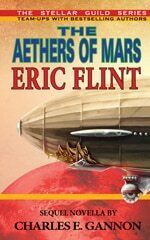 He controls a growing fleet of airships and aetherships, all designed after the first few that he used to wipe out the Boers to a Man, and sink three of her Majesty’s ships when they refused “the lawful orders” of the Black Parliament. With new colonies on Mars and Venus, patrolled by the Mourning-liveried Blackcoats , the vengeful hand of the Empire has become hard in the wake of Victoria’s assassination. Those same hard hands squeeze labor, royalists, and the Irish relentlessly, searching for the moral softness of decaying loyalty, of treasonous rot. At home, overseas, and off-planet, many voices grumble in many tongues. The UK’s growing friendship with America has decayed, Neo-Tory Imperialism (now finding strange common-cause with the Kaiser and his impetuous ambitions), finds itself at odds with the Franco-Russian Entente. Spain, smarting and eager to recover the self respect and territory lost in the war with the US, is a willing supporter of Rhodes’ British Interplanetary Company, an organization that boasts the largest private military in recorded history, and is the sole wielder of English airpower. It is the not-so-subtle fist that allows a power-hungry, pro-patria opiated minority of the United Kingdom to exert its expanding dominance. But, even as the Blackcoated Imperial Leviathan attains its greatest mass, seams and cracks are showing in its foundations. Former heroes of the Empire are taking subtle steps to challenge the brutal regime which Rhodes has funded. Radicals ally with traditionalists to remove the common threat. And the colonized peoples of the world eye the bloated body of the Empire, gauging. Watching for their moment to strike.